First opened at the end of the 19th century, the Hotel Nemzeti Budapest – MGallery by Sofitel has long been engrossed with Budapest’s flourishing artistic community. This affiliation began when Hungary’s famed Nemzeti Színház (National Theatre) occupied to a new venue at the neighboring Blaha Lujza tér (Blaha Lujza Square) in 1908. The hotel’s proximity to the theater made it an attraction among the city’s population of artists and scholars. 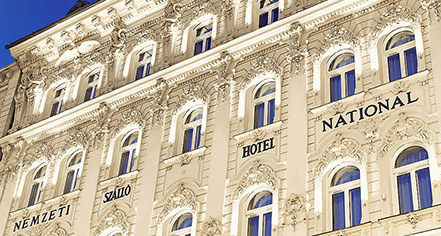 Sofitel is thrilled to have the Hotel Nemzeti Budapest as part of its esteemed collection of luxury boutique hotels. The Hotel Nemzeti has astounded guests for more than 100 years. A balance of contemporary flair and historical elegance await inside each one of the its outstanding accommodations. Guests will adore the luxurious amenities present within each room, such as complimentary refreshments, designer toiletries, and sumptuous bathrobes. Led by Head Chef Mark Pap’s ingenious team, the dining establishments at the Hotel Nemzeti provide a delectable assortment of Hungarian cuisine celebrated throughout the world as “Hungarikum.” Superb for hosting exclusive board meetings or corporate strategy sessions, this magnificent historic building is among the most sophisticated meeting venues in Budapest. Its charming Library Room can entertain up to 40 people, ensuring that guests can work within an intimate, intellectual environment. And for those who desire to organize something a bit grander can rely on the hotel’s beautiful, multifunctional Atrium to suit their needs. Consistently ranked as one of the most beautiful cities in the world, Budapest is the illustrious capital of Hungary. Formed from the medieval settlements of Buda and Pest, the city came into existence during the early 1870s. More recently, the city has emerged as a leading cultural center in Europe. Budapest is now considered an international innovator in such areas like fashion, entertainment, and art. Delve into this stunning history with a stay at the Hotel Nemzeti Budapest! Hotel Nemzeti Budapest - MGallery by Sofitel, a member of Historic Hotels Worldwide since 2018, dates back to 1896. The Hotel Nemzeti Budapest is particularly known for its take on a chocolate cake called the Rigó Jansci. The delightful pastry derives its name from the legendary Hungarian violinist who famously seduced the Princess of Caraman-Chimay, Clara Ward. Parking: Twenty-three euros per day. Payment: Visa, MasterCard, Amex, and Diners Club International are accepted. First opened at the end of the 19th century, the Hotel Nemzeti Budapest – MGallery by Sofitel has long been engrossed with Budapest’s flourishing artistic community. This affiliation began when Hungary’s famed Nemzeti Színház (National Theatre) occupied to a new venue at the neighboring Blaha Lujza tér (Blaha Lujza Square) in 1908. 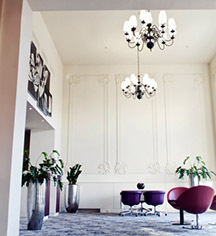 Learn more about the History of Hotel Nemzeti Budapest - MGallery by Sofitel .